Food trends are a double-edged sword. They can be fantastic and give a type of food or cuisine well-deserved attention and popularity. I remember when I was in Year 12, all of a sudden, sushi was uber trendy. The exquisite combination of salty soy, sweet salmon and hot wasabi was suddenly all the rage. The virtues of raw fish were extolled in many publications (I remember reading in Cleo years ago about the regenerative properties of salmon sashimi). Unfortunately there is another side to this: snobs. Sushi Trains were often where the alternative (and sometimes wanky) kids went after school. You’d hear sentences like, ‘oh God I’m jonesing for a sakinigiri’. Food trends also give people a chance to be snobby and seem knowledgeable (‘Oh please, every serious Japanese food connoisseur knows sashimi is the superior dish.’) This is the downside to every trend and something that should be ignored as snobbery is one of the many thieves of pleasure. I’ve noticed in the last couple of years that Moroccan food has become very popular; restaurants are serving their dishes in mini tagines and words like ‘harira’ (a style of soup simmered slowly with various spices including cumin) and ‘chermoula’ (a sauce that works as a salad dressing, marinade or even a dip) and becoming more commonly used in food writing. Of course, you get the people say they were cooking Moroccan food before it was trendy, but largely it has exposed the people from all works of life to a unique way of cooking and eating. For example, a typical Moroccan meal is often preceded by many salads, both hot and cold and then followed up with a tagine. This is an incredibly satisfying way to eat as well as lavishing your body with a multitude of nutrients. Personally, I think this is wonderful; Moroccan food, like Vietnamese food for example, is a delicious collation of influences from several countries over many centuries. I happened upon the following recipe in a book that is part travel memoir, part cook book, and couldn’t believe that something so simple could be so delicious. That’s the other wonderful thing about Moroccan cooking: there are often only three to four steps to a recipe and a modest amount of ingredients. Enjoy! 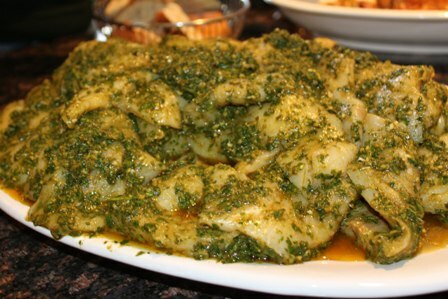 To make the Chermoula, combine all the ingredients and, using a mortar and pestle, grind until a thick paste is formed. Alternatively you can place the ingredients in a blender and blend until smooth. Pour a splash of olive oil over the base of a tagine (if you don’t have a tagine, use a sturdy based large pot). Scatter the carrots and celery over the base and add a little water. Place the tomato over the top then the fish and pour over the Chermoula. Put the lid on the tagine and place over medium heat and cook slowly for about 30 – 40 minutes. Once the fish is cooked through, scatter with the extra coriander leaves and serve with the lime wedges. This recipe was inspired by a similar recipe in “Made in Morocco”, written by Julie Le Clerc and published in 2004.